All recordkeeping is primarily the responsibility of the aircraft owner. The airframe and powerplant (A&P) mechanic is responsible for the work he or she performs. The owner of an aircraft must also ensure that maintenance personnel make appropriate entries in the aircraft maintenance records indicating the aircraft has been approved for return to service. The owner’s aircraft records shall also contain the inspections required pursuant to Title 14 of the Code of Federal Regulations (14 CFR) part 91, section 91.409. Proper management of aircraft operations begins with a good system of maintenance records. A properly completed maintenance record provides the information needed by the owner and maintenance personnel to determine when scheduled inspections and maintenance are to be performed. These records are retained by the owner and are transferred with the aircraft when it is sold. 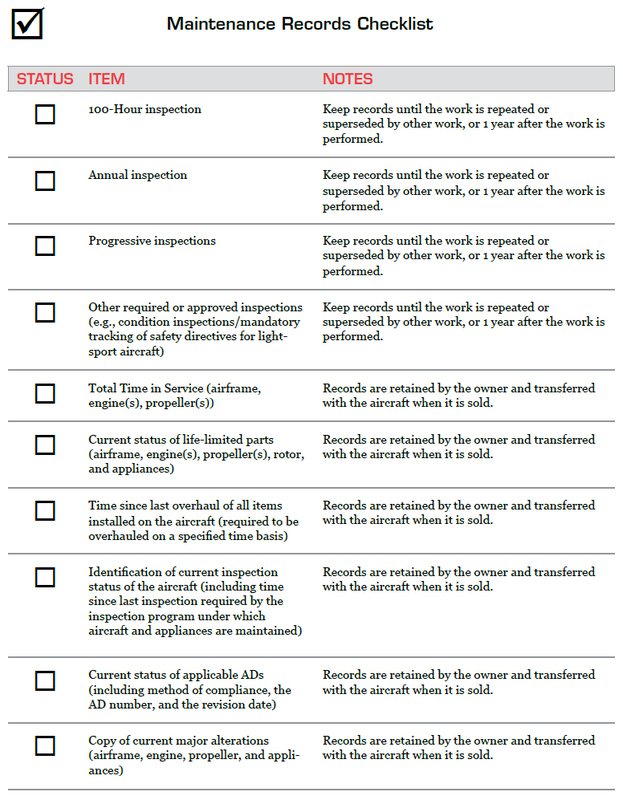 Figure 8-1 is a maintenance records checklist you can use to document compliance with the applicable maintenance requirements. Figure 8-1. Maintenance Records Checklist. This checklist includes the types of information that should be kept with your aircraft’s maintenance records. These records may be discarded when the work is repeated or superseded by other work, or 1 year after the work is performed. CAUTION: Keep in mind that as a result of repairs or alterations, such as replacing radios and installing speed kits, it may be necessary to amend the weight and balance report, equipment list, flight manual, etc. Most maintenance performed on an aircraft is recorded in the aircraft logbooks. As an aircraft owner, it is important to ensure that your aircraft’s logbooks are complete and up to date at all times. The aircraft logbooks outline the maintenance history of your aircraft, and any prospective buyer will want to review the aircraft and all maintenance performed. In addition, any A&P or certificated repair station performing maintenance on your aircraft will want to review the prior maintenance performed on the aircraft. An aircraft owner is required to comply with all applicable ADs issued by the FAA for his or her aircraft. The FAA issues ADs to notify aircraft owners and other interested persons of unsafe conditions and to specify the corrective action required, including conditions under which the aircraft may continue to be operated. Recurring action (if applicable) including the time and date of the next action required. Light-sport category aircraft certificated pursuant to 14 CFR part 21, section 21.190 have mandatory compliance with all manufacturer safety directives. 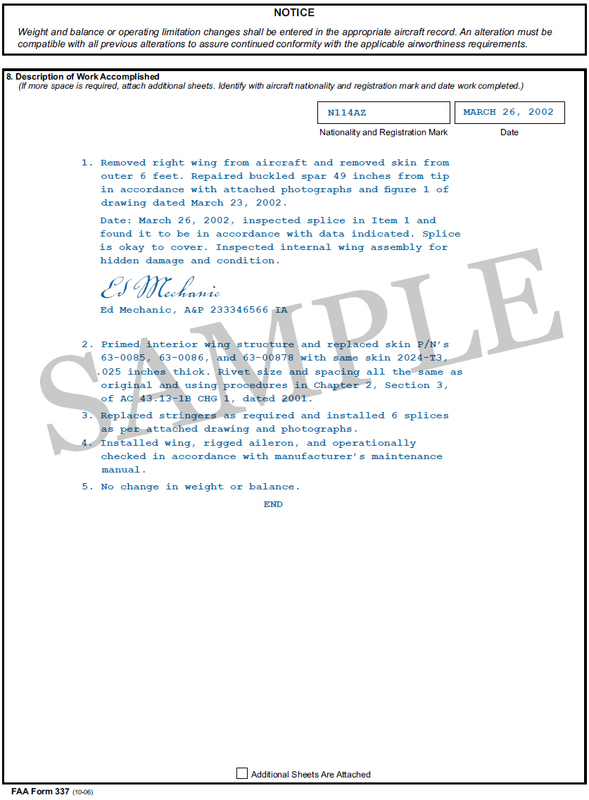 A service bulletin contains a recommendation from the manufacturer, with which that manufacturer believes the aircraft owner should comply, that often reflects a safety-of-flight issue that the manufacturer believes should be addressed within a certain timeframe. It may result from an improvement developed by the manufacturer, or it may address a defect in a product or published documentation. The manufacturer responds to one of these situations by issuing a service bulletin that recommends a certain type of inspection, replacing certain components, performing maintenance in a specific manner, or limiting operations under specified conditions. Sometimes, compliance with a service bulletin may be triggered by the occurrence of a particular event (e.g., the lapse of time or operation under certain types of conditions). A mechanic who performs a major repair or major alteration shall record the work on FAA Form 337 and have the work inspected and approved by a mechanic who holds an inspection authorization (IA). (Light-sport aircraft do not require Form 337 when altering a non-approved product.) A signed copy shall be given to the owner and another copy sent to the FAA Aircraft Registration Branch (AFS-750) in Oklahoma City, Oklahoma within 48 hours of aircraft approval for return to service. However, when a major repair is done by a certificated repair station, the customer’s work order may be used and a release given as outlined in 14 CFR Part 43, Appendix B, Recording of Major Repairs and Major Alterations. You can obtain additional information and instructions for completing FAA Form 337 in Advisory Circular (AC) 43-9 (as revised), Aircraft Maintenance Records. 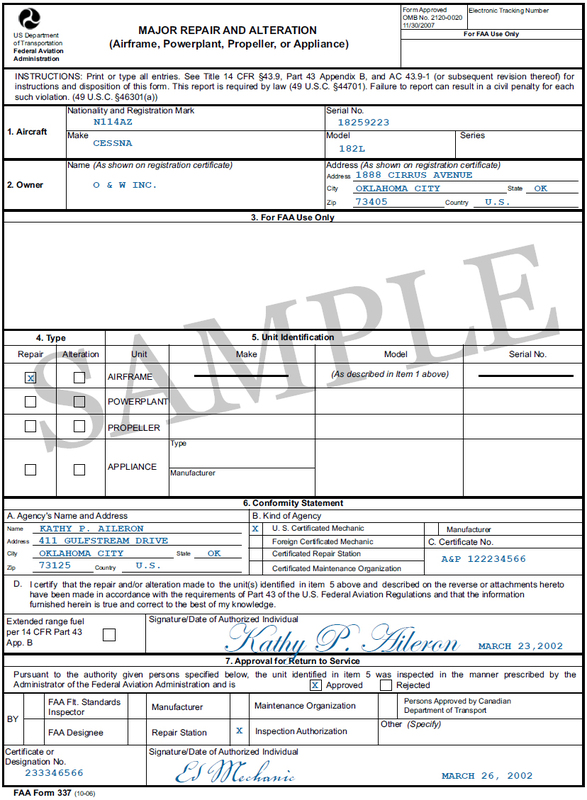 Figure 8-2 is a sample FAA Form 337. Figure 8-2. FAA Form 337, Major Repair and Alteration. You can obtain instructions for completing FAA Form 337 on the FAA website at www.faa.gov or from your local FSDO. Each time maintenance, including preventive maintenance, is performed on your aircraft, an appropriate entry must be added to the maintenance records. If the work was approved for return to service, the signature, certificate number, and kind of certificate held by the person approving the aircraft for return to service. A signed and dated listing of discrepancies and unairworthy items. A statement that a signed and dated list of any defects found during the inspection was given to the owner, if the aircraft is not approved for return to service. The date and signature of the person approving the aircraft for return to service. The date and signature of the person approving the airplane for return to service. 14 CFR part 91, section 91.207, requires that no person may operate a U.S. registered civil airplane unless there is attached to the airplane a personal type or an automatic type emergency locator transmitter (ELT) that is in operable condition and meets applicable requirements of Technical Standard Order (TSO)-C91. CAUTION: New ELT installations after June 21, 1995, must meet TSO-C91A (the first revised, or amended, version). 50 percent of the ELT’s useful life has expired. The condition inspection for amateur-built aircraft replaces the annual inspection. These publications are available on the FAA website at www.faa.gov and from U.S. Government Printing Office (GPO) bookstores located throughout the United States.